Available as a four-door sedan and five-door hatchback, the 2012 Chevy Sonic can be equipped with either a naturally-aspirated 1.8-liter or a turbocharged 1.4-liter four cylinder engine. The standard 1.8-liter engine produces 138 horsepower (HP) and 125 foot pounds of torque, and can be mated to either a five-speed manual or six-speed automatic transmission. The turbo 1.4-liter (which is shared with the Chevy Cruze Eco) also produces 138 HP but with 148 foot pounds of torque and is paired with a six-speed manual transmission. 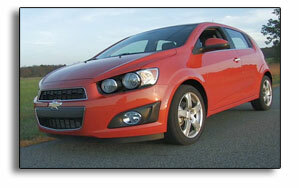 The official fuel economy estimates for the turbocharged 1.4-liter 2012 Chevy Sonic are 29 city / 40 highway MPG. The standard 1.8-liter Sonic is rated at 25 city / 35 highway with the six-speed automatic transmission and 26 city / 35 highway with the five-speed manual. We covered well over 500 miles in our six-speed manual Inferno Orange five-door Sonic LTZ Turbo review unit and had no problem meeting the official mileage estimates, achieving a average of 41.5 MPG on the Interstate highway and 34.3 MPG combined in temperatures that ranged from the high-forties through the seventies. Interstate highway testing temperatures were in the high-fifties. Our test unit was delivered with approximately 2200 miles on the odometer. The 2012 Chevy Sonic LTZ is equipped with with 17-inch painted aluminum alloy wheels and P205/50R17 Hankook Optimo all-season tires. The Sonic LS and LT come standard with 15-inch alloy wheels and P195/65R15 tires. 16-inch alloys with P205/55R16 tires are optional. Leave the line a bit too hot, and the turbo four will provoke plenty of wheelspin. The 12.2 gallon fuel tank delivers a good amount of highway driving range when driven conservatively. All 2012 Sonics are designed to run on regular unleaded gasoline. The four-wheel ABS brake system uses 10.8-inch ventilated front discs and 9-inch rear drums. The monochrome LCD Driver Information Center provides trip computer functions, an Average Fuel Economy display, and an upshift light. We’d like to see a real-time fuel economy display, added to next year’s model. The improvement over the outgoing Aveo is like night and day. It isn’t just that the Sonic rides and handles well … it’s genuinely fun to toss about, whether darting through city traffic or out in twisties. Chevy describes the Sonic’s design as being motorcycle-inspired and that’s clearly evident in the unique dashboard arrangement. The Sonic LZ’s interior features a leather-wrapped steering wheel with audio controls, leatherette seating surfaces and one-level front seat heating. The driver’s bucket seat offers four-way manual adjustment. A dual glovebox arrangement includes USB input and audio line-in ports in the upper glovebox, with provisions to either route the cable out, or store the phone or media player within. Bluetooth is standard, with phonebook downloads to the head unit. The six-speaker sound system includes XM Satellite Radio and Bluetooth audio streaming. iPod support is well done, with full access to playlists, albums, and artists. Three months of XM Radio and GM’s OnStar service are standard. The single 12-volt outlet is located between the front bucket seats. Test Vehicle Options: The turbo 1.4-liter is a $700 option on the Sonic LZ. Inferno Orange Metallic paint is a $195 option. The Sonic hatchback’s second row seats allow 38.1 inches of headroom and 34.6 inches of leg room. The four-door sedan provides slightly less headroom (37.8 inches). The five-door Sonic provide 19 cubic feet of storage with the rear seat up, and 30.7 cubic feet of storage with the 60/40 seat folded down. Wish List: The Sonic lacks adjustable lumbar support. All-in-all, the 2012 Chevy Sonic doesn’t just win the most-improved award, it’s muscled its way into the top of the sub-compact class alongside the Ford Fiesta and Honda Fit. While there’s room for improvement when it comes to fuel economy, there’s never been a tiny Chevy as fun to toss about, nor as well outfitted. The Aveo is dead. Long live the Sonic. Any comment on release point of the clutch petal? IE. High or low? How was the 6 speed manual transmission as far as smoothness, throws, etc? @G – Nothing sticks out in memory as to the Sonic’s clutch pedal release point, as far as being overly low or high. The shifter’s good for the price level, although the Fiat 500’s mechanism is my current favorite in the tiny car class. 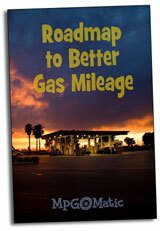 Does the Sonic have an instant fuel economy and average fuel economy display? Jordan – Our manual-equipped Sonic had an average fuel economy display and an upshift light. It lacked an instant MPG display.